Nastya is a girl from a good family. Mom is the famous actress and director Vera Glagoleva. The father is now the head of Rostekhov's holding company RT-Chemical Technologies and Composite Materials, and in the past the shipbuilder and adviser to the president of the Russian Olympic Committee, Leonid Tyagachev. For the first time Ovechkin and Shubskaya met when she was fourteen, he was twenty-three. She accompanied her father at the 2008 Olympics, he was already a superstar of world sports, came to Beijing to cheer. Shubskaya and Ovechkin danced their first slow dance at one of the after-parties. And in November 2014 Alexander saw a photograph of grown-up Nastya on Instagram, could not resist, wrote to the direct, received a phone and immediately called. But even at that moment young people acted like friends. The decisive turn in the relationship happened when Nastya flew to study in Los Angeles and went to the game "Washington": after that match, she was "obsessed" with hockey, and Alexander - with her. 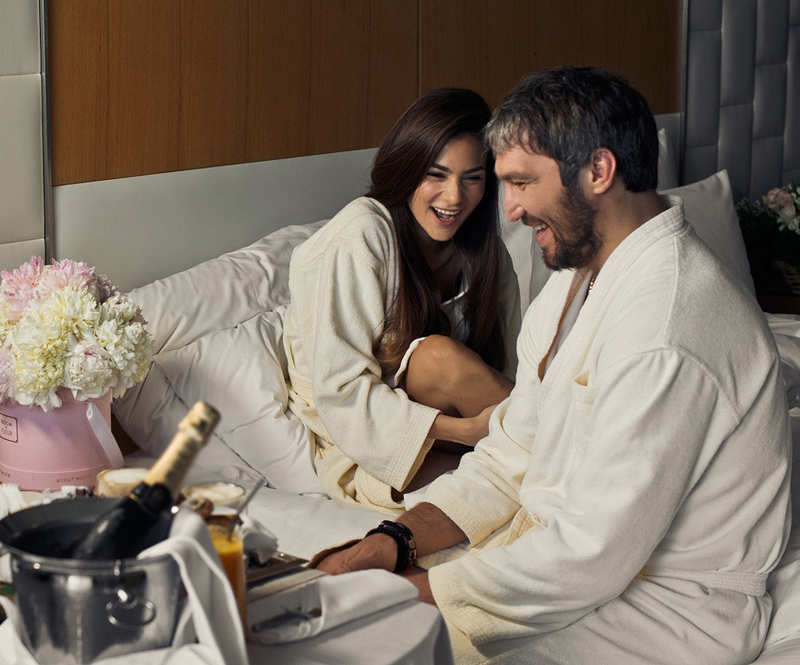 In September 2015, Ovechkin first asked Nastya's parents for their daughter's hand in marriage. And only then got down on one knee in front of his beloved and handed her a box with a ring. When the cherished "yes" sounded, the bride and groom went to celebrate till the morning at the floating restaurant "Seagull". Nastya and Alexander promised to frow a magnificent wedding, but in August 2016, suddenly "quietly" got married at the Fourth Wedding Palace on Butyrskaya (here, by the way, Shubskaya's parents had once married). The ceremony at the registry office was very quiet: not even the parents were present (Ovechkin and Shubsky with Glagoleva at that time were simply absent from Moscow). Friends of the couple also did not know anything - until the moment when they were gathered in the evening for dinner at one of the Moscow restaurants and Sasha announced: "We got married." Nastya and Alexander immediately said that the celebration would be in Moscow, from where both come from, and in the summer, between hockey seasons. But other details were shared reluctantly - so not to ruin the surprise. As a result, the whole Moscow spoke about the holiday at the "Barvikha Luxury Village" concert hall with hundreds of peonies, two wedding dresses (from designer Svetlana Lyalina and Zuhair Murad), Baccarat crystal on tables and a tea service as a gift from the Russian president. The newlyweds, as it should, drove off to the islands on a honeymoon. After the honeymoon they returned to Washington. Ovechkins live in a three-story mansion behind a forged fence in the Washington suburb of McLean. Black Labrador Blake lives together with the couple in the house with five bedrooms and nine bathrooms. Nastya, by her own admission, never cooked. But when she got married, she suddenly fell in love with cooking: she especially succeeded in borscht, meatballs and cakes with cheese in a creamy mushroom sauce with buckwheat. She has a time for herself only during her husband's business trips. She is interested in producing (she graduated from the New York Film Academy), but she needs to live in Los Angeles to work in film industry, and she does not want to leave her husband for long, because there is no such thing as long-distance love. In addition, Ovechkin and Shubskaya have an excellent "alternative" career plan - both want many children.